SomaFM - Our perennial favorite for Christmas music is the listener-supported and DJ-programmed SomaFM, which has four live-stream holiday music stations. Christmas Lounge, which seems to always show the largest number of listeners, stream laid-back holiday vibes with "chilled holiday grooves and classic winter lounge tracks" that are family-safe. As I update this article for 2018, DJ Rusty Hodge is playing an eclectic seasonal playlist that includes J-Boogie ("Dance of the Snowflake"), Eartha Kitt ("Santa Baby"), Dean Martin ("Silent Night"), and Oscar Peterson ("God Rest Ye Merry Gentlement"). If that's a bit too mellow for your taste, SomaFM has other holiday choices. Christmas Rocks! is an indie/alternative holiday rock channel with artists that include Bruce Cockburn ("Joy to the World"), Woods ("Christmas Time is Here"), Kenny Laguna ("Home for Christmas") and Michael Lyons ("Last Christmas"). Xmas in Frisko is a "wacky and eclectic holiday mix, not for the easily offended" that this year is playing Bob Rivers ("Oh Come All Ye Grateful (Deadheads)"), Klezmatics ("Hanukah Tree"), Bob Wire & Chip Witson ("Santa's Got a Sharkskin Suit") and Found Sound Orchestra ("Santa's in a Hula"). Jolly Ol' Soul, meanwhile, brings some soulful holiday music from Baby Washington ("White Christmas"), Otis Redding & Carla Thomas ("New Year's Resolution"), Jimmy Reed ("Christmas Presents Blues"), Salsoul Orchestra ("Merry Christmas All"), and many other soul artists. Pandora - You will find a lot of variety on Pandora, with holiday music in nearly any category you can think of. To find the holiday stations, select Browse from the menu at the top of the Pandora home screen, then scroll down to the Moods and Activities section and select Holidays. There you'll find 54 (at the time this article was written) holiday stations. The station titled simply 'Christmas' is currently the most popular, showing a total of 60 million listeners. 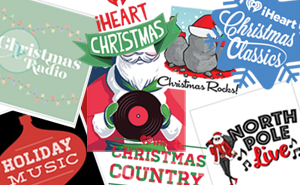 Other popular stations include Christmas Traditional, Today's Christmas, Classical Christmas and Country Christmas. Other stations in more "niche" categories include Tropical Holidays (Jimmy Buffett, anyone? ), Christmas Rappin', Reggae Holidays, Bluegrass Christmas, and Folk Holidays. TuneIn - To find the TuneIn holiday stations, go to the channel's home screen and scroll down to Music under "What do you want to listen to?" You could select Holiday Hits from the top of the screen, but scroll down to 'Tis The Season for that station plus Holiday Standards, Classical Holiday, Country Christmas, and Holiday Jazz. For more options, use the search function to search on "Christmas" which currently returns 75 results. You'll find Christmas radio stations from the U.S. and around the world. iHeartRadio - I know there are iHeartRadio users out there, but this channel has fallen off our list this year. Even though I'm logged in and connecting from the US, when I select the Holiday option under Music & Entertainment I receive an error that this content is not available in my country - major fail. Searching on "Christmas" returns only 10 results per category: 10 live stations, 10 artists, 10 songs. 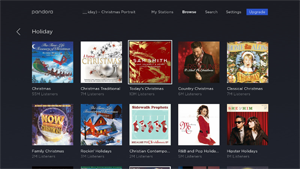 Also, missing from the search results are four the five custom Christmas stations, with only iHeartChristmas available. Gone are iHeartChristmas Classics, iHeartChristmas Rock, North Pole Radio, and iHeartChristmas Country, which are still available through a web browser. Those are our top recommendations for streaming holiday music on Roku. Even though we have only three Roku channels on our ilst - SomaFM, Pandora, and TuneIn - you'll find more than enough holiday music on these channels to keep you entertained throughout the season. Check out our Roku Christmas Channels list for all holiday-specific channels. A complete list of Roku music channels can be found here.